Engage Your Employees with Reward Programs! Considering the advertising, interviewing and training expenses a company incurs when hiring a new employee, it is easy to see why employee turnover can be costly. Many municipalities and public works across the United States have decided to implement years of service employee recognition programs in an effort to decrease these costs and ensure employees feel valued and recognized for their hard work. It is estimated that one out of three employees will resign from his or her current position in the next two years. By starting an employee award program, you are sending a message that employee loyalty is appreciated and valued. 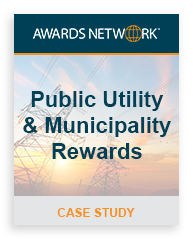 A public utilities company wanted to implement an employee recognition program in an effort to increase employee engagement and loyalty. Awards Network designed a recognition award package with the company logo featured on the cover, a certificate of appreciation signed by the general manager, a letter of congratulations from the human resources director and a catalog and ordering form for a gift. Employees who reached milestone anniversaries along with employees of the month and quarter were all recognized at a quarterly ceremony. The employee award program generated excitement at the first banquet that truly helped to rejuvenate the worker’s attitude. Within the first two years of the program, employee turnover was reduced by 23% improving the public utilities company overall budget. In addition, as a result of the increased employee engagement, poor recruitment rates were reversed dramatically and referrals became much more frequent. Interested to find out more information on our recognition awards? Contact Awards Network to discuss how our employee recognition programs can work for your organization.